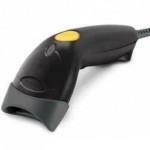 LS1203 Bar Code Reader is ideal for gift shops, boutiques, video, sporting goods stores, jewelers, florists and more. It is easy to use, it delivers high quality laser scanning at an affordable price. It delivers the features, functionality and reliability needed to improve operational efficiencies from the checkout line to the back room. It minimizes manual keying and ensures that customers are charged the correct amount. It automates paper-based inventory processes and integrates multiple interfaces that help ensure connectivity to host and PC systems now and in the future.